Poison and Cheap Trick are teaming up for a late spring/early summer tour of North America. The 6-week run – with guests Pop Evil – will begin on May 18 at the Five Points Amphitheatre in Irvine, CA. 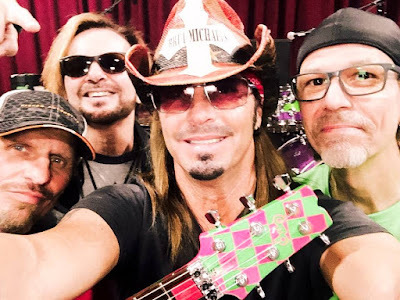 The trek sees a return to action by Poison following a 30th anniversary tour in 2017 that marked the first time in over five years that the group hit the road with its original lineup of vocalist Bret Michaels, guitarist C.C. DeVille, drummer Rikki Rockett and bassist Bobby Dall. “The all original Poison is headlining again this summer,” says Michaels. “It’s going to be a mega concert and party combined. We will be playing all the hits and bringing high energy rock and roll good times. I promise this will be awesome. My friends Cheap Trick and Pop Evil will be joining us as well as some special guests on select dates. Again, I know all the bands with all the hits will be giving 1000%!!! "Another Poison/Cheap Trick Tour!! !,” adds Cheap Trick guitarist Rick Neilsen. “It’s always been FUN with these guys!" Each band are now offering their own exclusive VIP packages and meet & greet opportunities – Poison will present direct-to-fan access to the best seats in the house via their own exclusive pre-sales at PoisonOfficial.com, while VIP Packages for Cheap Trick will be available for all dates, with details available at CheapTrick.com. Openers Pop Evil will also be offering VIP meet & greets at PopEvilVIP.com. Tickets will go on sale to the general public starting Friday, February 9 and Saturday, February 10.